A NOT-SO-BRIEF HISTORY OF THE PINES. This building has been built in stages over its long lifetime. The oldest part of the structure is the KITCHEN WING. This dates back to 1760. The Durham Historical Society chose it for its representative house on the Durham Quilt, an example of which is hanging in the front hall. In 1825, the Marquis de Lafayette (of Revolutionary War fame) came back to America to visit it. We believe he stayed in the upstairs back bed-room now renamed the Lafayette Room. Legend has it that the family put aside a washbasin and pitcher he used. These can be found sitting on top of the glass case collection in the front hall niche. The kitchen wing was known as the KINGMAN FARM. In the 1860s, Kingman built a 16 ROOM ADDITION as a Victorian summerhouse for an affluent New York City surgeon named Dr. STEELE. Legend has it he came by railroad to Durham for the summer but could not convince his friends to visit him. He sold it to JOSEPH COE in 1870, who had served as postmaster for Durham and had made a fortune holding gold after the Civil war had resulted in a ruinous currency inflation for the North. The TOWER SECTION was thought to be a later addition, but photos from the 1880s show it to exist in its entirety. The tower is a copy of the Italianate architectural style of building towers as islands of safety during times of civil insurrection in Italy. They are mainly found in Florence and Venice. 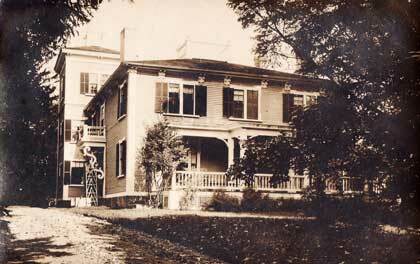 The 16-room addition was restructured in 1922. An architect came to spend the summer here studying the house for possible movement to another location further away from the roadway and on the pond. This possible option was not chosen as it was thought that moving the structure would cause the destruction of the three remaining French chimneys (of which only one now remains standing.) and six fireplaces. One French chimney and two fireplaces were removed when the side entrance was built in 1922. A coal-burning furnace was installed in the cellar, with radiators in the above rooms added for winter warmth. A front entrance, which led to a staircase to the second floor, was removed. This staircase was changed to the now existing side entrance and staircase, and the front porch modified to add screened porches on two floors. The driveway was changed to come in from its now-existing entrance, instead of in front of the building. The original driveway had small cedar bushes lining it. The two huge cedars growing in front of the main doorway are from the original line of bushes on the drive that were planted in 1922. The circle in the center of the driveway contains what was the largest Norway Spruce tree in North America. This towering trophy double-tree was struck by lightning in 1980, but the massive trunk remains for now. Dave Ninde said it sounded like thousands of pains of glass shattering. A sister tree was planted circa 1880s at the same time and cam be seen to the right of the summer porch on the pond. The house became the retirement estate of Mr. Daniel B. Ninde, an attorney from Fort Wayne, Indiana who had married Mary Coe, the daughter of Joseph Coe, the Postmaster. Joseph Coe’s father was a shipbuilder, and launched over 40 ships from the banks of the Oyster River in the 1820s and 1830s. Mary Coe died in 1912, and Daniel Ninde later married her sister, Margaret Coe. Daniel B. Ninde was the founder and single largest stockholder in the Lincoln National Life Insurance Company, a large company that exists today in Fort Wayne. Daniel Ninde’s first son was David Ninde who stayed on to care for his aging mother. Two other brothers were Daniel Ninde (now deceased), and Richard Ninde formerly of Columbus, Ohio. David and Richard matriculated from Harvard’s Graduate School programs. Daniel B. Ninde was a Midshipman who matriculated from the Annapolis Naval Academy. His son, Daniel M., matriculated from Annapolis and served in the Navy as an officer aboard a ship in the South Pacific during WWII. Mary Coe’s portrait is found over the fireplace in the Dining room. The minor American artist, Henry Orne Ryder, who lived next to Mary Coe in Paris during 1887, gave her the small watercolor located to the right of the portrait. The other paintings and artwork found on the fireplace are by the same artist. The Japanese prints in the dining room and front hall were discovered in two locations -- a drawer in the tower room, and an old dresser in the barn that had been rained on for over 50 years.. They have been restored and put back up again. The furnishing in the dining room exists from the 1922 period. The table, chairs and sideboard were a gift from a relative, Burt Curry, who was a research scientist for M. I. T. Mr. Curry invented chrome plating, but did not patent it. While touring the Ford plant in Michigan, he saw the chrome room where bumpers were being prepared. He asked the formula they were using, and they replied that they were using the Burt Curry formula. Family legend says that he chose not to identify himself at the Ford factory. From 1920 to 1970, a couple named Bill and Nancy Kilgore looked after the house. Bill did the handiwork around here, and Nancy cleaned and cooked for the Ninde family. Bill was a soldier in WWI, and met Nancy in England. After the war, he went back to England, married her, and returned to Durham. He became a Maine Guide with a summer hunting lodge located in Patten, Maine. He spent his winters in Durham. David Ninde married Caroline Smith, daughter of Viola and Harry Smith. Harry Smith was a minister who taught Economics at UNH before entering Labor Reconciliation during W.W.II. His wife, Viola Smith, was a tireless crusader for the American Cancer Society. Many plaques of recognition can be found for Viola hanging the hall leading to the second floor porch. Viola Smith was a collector of antiques. There are three cases of antiques on display that she gathered. One is a collection of pitchers found in the corner cabinet in the front hall. A second is next to it in the large Eastlake cabinet containing pewter, china, mercury glass, cut glass, colored glass, ivory pieces from Alaska gathered in 1920, and copper pieces. A third glass case contains a variety of glass pieces from both Viola Smith’s and Margaret Coe’s collections. Over 600 pieces of remaining glass in the collections were donated to the Maine Museum in Portland, Maine and can be found there. Bedroom furnishings are from the Nineteenth Century. The Oriental rugs on the first floor have been in the buildings these many years. The Oriental rugs in the sleeping rooms are new but genuine. Much of the furniture in this home had been stored in the barn and was brought out and restored for current use. Wall furnishings are largely original and indigenous to the home. The house is now furnished as it was during the 1950s to 1980 period and is intended to imply understated quality and New England Yankee reserve. Curtains similar to what was there are mostly white, modest, and understated. Probably the Victorian curtains used in the 19th century were heavy, dark, and puddled in a heap of conspicuous consumption on the floor-- out of keeping with later thinking. The barn was originally a large Yankee styled barn. In 1922, this barn was cut in half and restructured with steel beam supports, and a second floor hardwood dance floor was added for entertaining. The hip roof of the barn was rebuilt to match the main house. During World War II, Margaret Coe was ill and required full-time nurses to care for her. It was decided that her son, David Campbell Ninde, should not raise his family in this environment, so a carriage house was moved from across the circle drive, and placed between the house and the barn to become the present structure. A 2200 square foot 3 bedroom home was built in it that exists today. David Ninde and Caroline Smith (both deceased) have two children, Mary Margaret Jaques and Thomas Ninde. David Ninde was in Government Service. Tom lives in a family summer home built by Harry Smith in Acton, Maine. He was in the Submarine Service during the Vietnam War. Mary Margaret married Roger Jaques in 1966. Both are alumni of UNH. Roger matriculated from one of Harvard’s Graduate programs majoring in Art History. They have restored The Pines to its present condition. In 1995, Roger Jaques retired from Government Service and began the Guest House. They have two children, David Jaques and Caroline Osteen (married name). The flat section of lawn behind the parking lot was once a clay tennis court. The screened porch overlooking the pond has recently been added. Smoking is permitted in that screened porch. Swans have summered in the pond since the late 1970s. They can be fed from the dock in front of the screened porch. They are not particularly bothered by the dogs. A cellar hole remains in the field to the right of the driveway entering the property. It is seen as a clump of trees just before the woods start next to Route 4. It is believed that this is the location of the original homestead burned in the Indian Massacre of 1690 where Indians killed all occupants of the dwelling. Presumably they are buried there. Across the street is the Oyster River. Originally sheep pasture and farm land in the 1800s, this has grown back to now contain mature trees along the banks of the river. Jackson’s Landing is across the street. There the town maintains a dock into the tidal river, which can be used by visitors from The Pines. Swimming is possible during summers when the river is at high tide. UNH crews and stores its sculls at Jackson’s Landing. Small boats can be launched there. The river is used for fishing smelts during winters when ice is present. Usually small wooden shacks are set up for this activity. 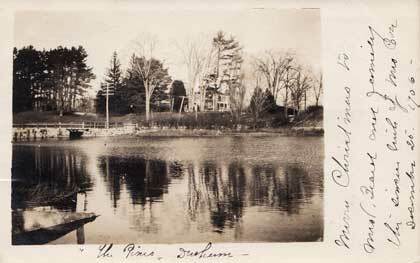 This is a small sample of the extensive history of both the family and events that have trasnspired here at The Pines. If you would like to learn more, the caretakers love sharing countless tales from both history and present day. History is a usual discussion topic at breakfast which is served on a table, that much like many of the artifacts in the home, that has a story all on its own.